Keeping Leonardo Helicopters in the air! 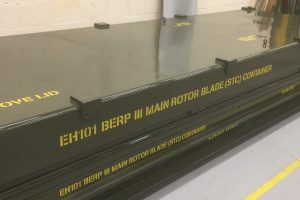 As an approved supplier for paint finishing to Leonardo Helicopters we worked closely with our customer Keyford Precision Engineering to re-furbish the first of several EH101 helicopter rotor transport containers. 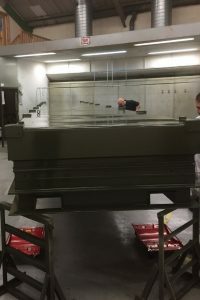 These containers are over 6 meters long and required extensive re-finishing both in respect of the hardware as well as the paint finish and stenciling. 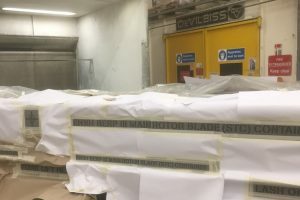 The processes and materials involved were all in accordance with tightly controlled specifications and would ensure the containers would take many more years of use before requiring further attention. Keyford came to our premises and we examined the container and agreed a strategy. Keyford initially repaired the hardware. We then cleaned, prepared and re-painted the container to the required Aerospace specifications. The final step was to manufacture in-house and apply new stencils ensuring all relevant information is clearly visible, again in accordance with Aerospace standards. 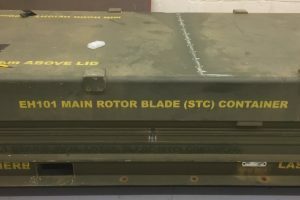 The finished container, now looking like it was newly manufactured, can now be put back into circulation transporting rotor blades around the world for many years to come.